When a doctor or other health care professional causes injury rather than cures it, you have the basis for a medical malpractice lawsuit if there has been a deviation—either an act or failure to act — from established medical procedure. That injury can happen under a variety of circumstances, such as doctor negligence, surgeon error, or the failure to diagnose cancer. At M. Blake Heath, Trial Attorney LLC, we are experienced medical malpractice attorneys who can help you recover when you are the victim of malpractice. Surgical error cases: For example, sponges left in the body or pierced arteries. Failure to Diagnose: Doctors have a duty to determine the sickness or illness, when they fail to properly diagnose a patient, that may be medical malpractice. Punitive damages: While even good doctors make mistakes, sometimes they are negligent and punitive damages are necessary to hold them accountable. Hospital and Institutional Malpractice: When a hospital hires unqualified or under-qualified professionals, they must be held accountable. Our attorneys are effective in using demonstrative exhibits and expert witnesses to win our cases. 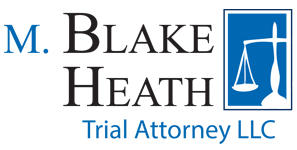 M. Blake Heath, Trial Attorney LLC is a small Kansas City firm focusing on personal injury, such as semi truck accidents, catastrophic personal injury, and insurance bad faith. We are client-centered and responsive to their needs. Our attention to our clients and willingness to pursue avenues that other attorneys have missed has resulted in multiple six and seven figure verdicts and settlements. In addition, our peers have recognized our contribution to the legal community with many awards and professional offices. If you have been the victim of medical malpractice in Jackson County, Missouri, contact an experienced medical malpractice lawyer at M. Blake Heath, Trial Attorney LLC.